Perhaps as a holdover from my old cosmo-swilling days, I usually have a number of fresh limes on hand, but rarely any lemons. But we recently happened to have a couple extra after jarring a batch of preserved lemons, and I resolved to make good use of them. I also happened to have a bottle of gin I’ve been itching to open. 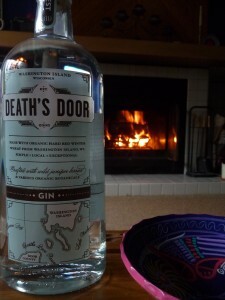 Back in April, when we visited Door County, Wisconsin, I picked up a bottle of Death’s Door Gin. This gin is actually vintage, marked with the date the “organic hard red winter wheat” was harvested from Washington Island: August, 2009. Because Washington Island, set at the very end of the Door County Peninsula, is a particularly scenic and tranquil spot, I couldn’t resist this gin made from its wheat (as well as “wild juniper berries and various other botanicals”). On its own, the gin has a nose of juniper (of course) and a bit of fresh mint. Sipped neat, anise flavor gives way to juniper before a hit of white pepper.